Google Earth is an amazing resource, but if there's one criticism that can be leveled at it, it's that it's permanently out of date due to the lag between when the data is acquired and when it appears online. 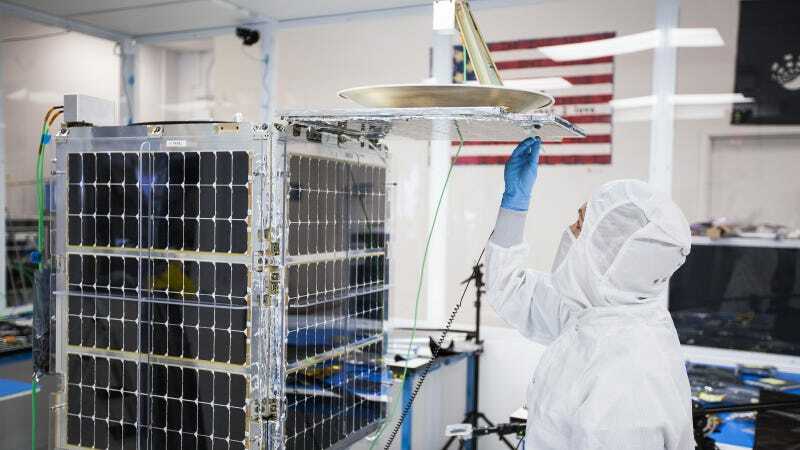 But right now, a pair of Californian startups are putting swarms of tiny satellites into space, creating real-time satellite imagery that will solve that problem. The two companies both share the same vision: shove enough small satellites into orbit, and sheer force of numbers will make it possible to photograph the same patches of the planet several times a day. It's not just a concept, either: Planet Labs, based in San Francisco, launched 28 of its satellites into space yesterday. Known as "Doves," these adorable little guys are about the size of a toaster, weigh around 11 pounds, and acquire images at a resolution of nine to 15 feet. Meanwhile, over in Palo Alto, Skybox Imaging is building 24 larger satellites, each weighing in at about 100 kilograms and capable of acquiring images at three foot resolution, which it plans to launch in November of this year the first of which it launched on November 21 2013 and is now capturing both imagery and HD video. Once the satellites are up in the air and it's established they're working properly, both Planet Labs and Skybox Imaging will initially push their data to commercial parties. Their images might be used to monitor traffic systems, survey industrial plants, or observe changes in cultivated land. But, as Nature points out, the projects hold more promise than simply making monied companies more cash. Imagine how useful these kinds of images could be during and after natural disasters or humanitarian crises: rapid observation of floods or earthquake zones could have a massive impact on the way we deal with those emergencies, and save hundreds of lives along the way. No wonder, then, that the United Nations' Operational Satellite Applications Program is sniffing around the emerging sector. Science could benefit, too, with the increased temporal resolution of satellite imagery providing more efficient ways to map changing habitats, movement of wildlife, volcanic eruptions, and anything else that moves on the scale of hours rather than days. There are, of course, limitations. These little satellites orbit low, moving at thousands of miles an hour, which means they're useless if you want to observe a single patch of land for more than a second or two. There's a question mark, too, over how consistent the imagery will be, which will remain unanswered until the swarms are truly established. And compared to using drones for real-time aerial imaging—which is, admittedly, limited to small areas—it's an expensive option.